Not to be confused with Kevin Pillar. For those of a similar name, see Kevin Miller (disambiguation). Millar on September 13, 2008. Kevin Charles Millar (/mᵻˈlɑːr/; born September 24, 1971) is an American former professional baseball first baseman and current analyst for MLB Network. He currently is a host along with Chris Rose on the MLB Network show Intentional Talk. Millar was born in Los Angeles and graduated from University High School in Los Angeles. He attended and played college baseball for Lamar in Beaumont, Texas. Under the tutelage of Coach Jim Gilligan, Millar and the Cardinals prospered. For two seasons, Millar was a key part of Lamar's return to prominence in collegiate baseball. In 1992, Lamar went 32–21, posting the NCAA’s biggest turnaround with a 14-victory improvement over the 1991 season. Millar led the Cardinals that season in runs (41), hits (56), home runs (13) and runs batted in (50), and he earned All-Sun Belt Conference honors. The next season, Millar helped lead the Cardinals to a 44–18 record, to the SBC regular-season and tournament championships and to a berth in the NCAA’s Central 1 Regional in College Station. at Lamar. In 1993, Millar began his professional career with the Saint Paul Saints of the Northern League. Millar was a replacement player during the 1994–95 Major League Baseball strike, when he played with the replacements in early 1995 and therefore, he is barred from membership in the Major League Baseball Players Association. From 1997 to 1999, during games encompassing several minor league stints, Millar set the record for most consecutive games reaching base with 71 straight (although this statistic only began to be formally tracked in the minors in 1996). This record was tied in 2003 by future Red Sox teammate Kevin Youkilis. His contract was purchased by the Florida Marlins at the end of the season and he made his major league debut for Florida in 1998. 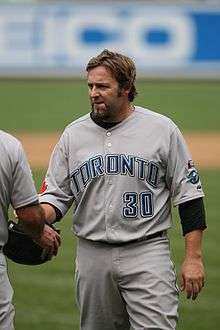 Millar played for the Marlins from 1998 to 2002, and was later sold to the Japanese Central League Chunichi Dragons. In order for the transaction to be completed, he first had to clear the waivers requested by the Marlins, but the Red Sox broke an unwritten rule and blocked the deal with a waiver claim. In an unprecedented deal brokered by MLB, the Marlins later repaid the money that the Dragons had paid for Millar, and the Red Sox paid a similar sum to the Marlins in return for Millar. His clubhouse presence and offensive production helped spark the Red Sox to the 2003 American League Championship Series and the 2004 World Series. During the 2003 playoffs, Millar began using the phrase "Cowboy Up", and in 2004 referred to his team as "idiots" to keep teammates loose during the stretch run to the World Series Championship. Millar had a lead-off walk in the 9th inning of Game 4 of the 2004 ALCS against the Yankees, which, along with Dave Roberts' steal of 2nd base that inning, and RBI single by Bill Mueller proved to be the turning point in the series. Prior to the game, Millar was caught on camera numerous times telling reporters and his teammates "Don't let the Sox win tonight", in reference to Game 4 and in reference to the fact that Pedro Martinez and Curt Schilling were scheduled as the starting pitchers Games 5 and 6, respectively. On April 20, 2012 Millar, together with Pedro Martinez gave a toast to Fenway Park on the 100th anniversary of the ballpark. Millar and Martinez stood on top of the home dugout and gave a toast that was the largest in history, according to the Guinness Book of World Records. 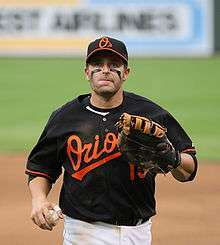 Millar signed with the Baltimore Orioles on January 12, 2006 as a free agent. During the season he broke Rey Ordóñez's record for most games played by any non-drafted player who started his career in the Independent Leagues during the Draft era. Initially in Baltimore, he was not an everyday player. However, when Dave Trembley took over the team, he began to play more regularly. On August 23, 2007, Millar reached base safely for the 50th consecutive game, setting a franchise record for the Orioles. On August 26, 2007 Millar's streak came to an end at 52 games. It was the 7th longest streak since 1957. On February 11, 2009, Millar signed a minor league deal with the Toronto Blue Jays as a non-roster invitee. He successfully made the roster, serving as a backup to first baseman Lyle Overbay. After Alex Ríos was claimed off waivers, Millar switched his number from #30 to his former #15. On February 1, 2010, Millar agreed to a minor league contract with the Chicago Cubs, with an invitation to spring training. However, on March 30, he was released by the Cubs after not making the major league team. Millar announced his retirement on April 21, 2010, though on April 27 on MLB Network Radio with Jim Duquette and Kevin Kennedy, he stated it was not official as he still wanted to play. Millar joined MLB Network as a studio analyst. On May 20, 2010, Millar also joined New England Sports Network (NESN) as a pre-game and post-game analyst. On May 22, Millar made his debut for Fox Sports and its MLB on Fox Saturday telecasts. He served as a pre-game, game break, and post-game analyst for its primetime games in the studio, as well as a fill-in color analyst for select games during the season. On May 5, 2010, Millar returned to baseball when he signed a contract with the St. Paul Saints of the American Association, the same team with whom he started his career. His contract language also allowed him to leave the team to carry out his broadcasting duties. After the 2001 season, Millar was awarded the Charlie Hough Good Guy Award by the Florida chapter of the Baseball Writers' Association of America. After the 2003 season, Millar was awarded the Jackie Jensen Award, which is presented each year by the Boston chapter of the BBWAA. The award is presented to the player who best exemplifies the spirit and desire of Jackie Jensen, the former Red Sox outfielder. While an active player, Millar was not a member of the MLBPA (Major League Baseball Players Association), and therefore his name or likeness could not be published in officially-licensed video games. Many games nevertheless included him and other non-MLBPA players, with fictional names and different appearances. In MVP Baseball 2004, he was not included. In MVP Baseball 2005, The Bigs and MLB Front Office Manager, Millar is replaced by "Anthony Friese". In Major League Baseball 2K5 and Major League Baseball 2K6, he is replaced by "Carlos Ahearn". In MLB 07: The Show and in MLB 08: The Show, he is replaced by "Ivan Jimenez". In Major League Baseball 2K7, Major League Baseball 2K8 and Major League Baseball 2K9, Millar is replaced by "Kyle Morgan", with the same initials. In MLB Power Pros 2008, he is replaced by "Great Johnson". In MLB 09: The Show, on the online roster update, he is replaced by "Dave Herman". In MLB Dugout Heroes, Millar is replaced by "Kane Matthews" with the same initials. In all instances, the statistics of these characters are based on the real Kevin Millar. Chris Rose and Kevin Millar film a segment of Intentional Talk at the 2013 World Baseball Classic semifinal game 1 at AT&T Park in San Francisco, California, USA. Millar made an appearance (in actual game footage) in the movie Fever Pitch in which he walked and was lifted for a pinch runner. Millar co-hosts the MLB Network show Intentional Talk with Chris Rose. He repeatedly uses the phrase "Got heeem" which has become a signature part of "Intentional Talk". Millar is married and has four young children. Millar currently makes his residence in Austin, Texas. Millar is the nephew of former major league outfielder Wayne Nordhagen. 1 2 3 "On-Air Personalities: Kevin Millar". MLB Network. Archived from the original on February 1, 2013. Retrieved November 23, 2012. 1 2 "Millar a 'union guy' 12 years later". The Carroll County Times. July 8, 2007. Archived from the original on June 25, 2012. Retrieved May 29, 2010. 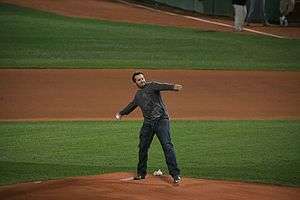 ↑ "'Cowboy Up' is Kevin Millar's Lasting Legacy in Boston". NESN.com. 2010-05-26. Retrieved 2016-10-24. ↑ Ginsburg, David (July 17, 2007). "Millar on Baltimore: 'I Want to Be Here'". The Washington Post. Retrieved May 7, 2010. ↑ "Blue Jays sign Millar". MLB.com (Press release). February 11, 2009. Archived from the original on February 13, 2012. ↑ Crasnick, Jerry (February 1, 2010). "First baseman Kevin Millar, Chicago Cubs, agree with 1-year minor league deal". ESPN.com. Archived from the original on February 6, 2010. Retrieved February 2, 2010. ↑ http://www.lamar.edu/newsevents/cc/461_2320.htm/ Archived December 6, 2010, at the Wayback Machine. Wikimedia Commons has media related to Kevin Millar.